he uses and platforms for exploiting this medium are continually growing, evolving and above all - are scaleable - this medium is now in the reach of all business's, so you too can get in on the action and make it work for your business. very business has a story to tell - something to show or something to talk about - using animation is the perfect way to impart that messaging in a, memorable and engaging way. There is no better time than now, to get the best leverage from this medium, raise the bar in the way your business tells its story, in a way and with a reach that you never thought possible. What is CGI & Vfx? GI or computer generated imaging is as the phrase suggests - it is an image or images that have been generated or manipulated by computer. Vfx is an abbreviation of visual effects, these are the processes by which an image is created and/or manipulated outside the context of a live action [filmed] shot. 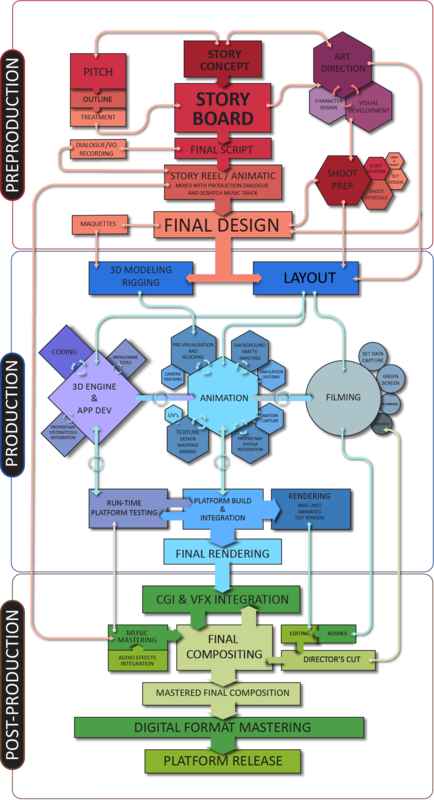 Why should I use CGI & Vfx? ost of you will have heard the saying: 'a picture is worth a thousand words.' Well how many words is a moving picture worth? It's the most powerful storytelling medium there is. It is simply one of the best ways of imparting story, description, meaning and feeling and it is only restricted by imagination and budget. Can CGI & Vfx be expensive? t can be expensive but it doesn't have to be, CGI and Vfx are on the edge of advancing technology, so it is always changing. Methods become faster, easier and cheaper over time, implementing newer processes may be more time and budget consuming. Above all, having comprehensive pre-production will help you get the most out of any budget. his depends on a number of factors, visual expectations and the complexity of the project, approval cycles/stages involved and of course budget available. A higher budget can yield a bigger team and faster turnaround, however some processes do not benefit from a larger crew. The time estimated would always be unique to each individual project. elow you can explore the infographic detail, click on the relevant expandable box to gain more insight to that particular part of the process. Some of the panels will explain nearby processes that are not listed in the panels. The initial challenge, the seeds of an idea are sewn. We break open the concept of what is required and look at the various aspects of what story is to be told, to whom, why and how it should make them feel and think. The results of this are then fed to creative streams for summarising and then expanding upon. Pitch documents vary in shape, guise and length, but generally - depending on the anticipated production, it will provide a simple, concise overview of the basis of the production and what it is about: Outline, Logline, Genre, Plot, Characters, Tone, Conclusion. A general outline is also formed, along with proposed treatment. These feeds through to other Preproduction processes. Great art/creative direction is paramount, as this will be the guiding eye's throughout the numerous stages of production, so a keen view of detail, quality, balance, aesthetics, flow and continuity all play a role in shaping up the production to meet its original expectations. This is cyclic process for many productions and also requires input/overview at all stages in production. All previous elements, discussions and documents are then forged into a storyboard, a visual, panel by panel, representation of what is to be produced. A storyboard can be quite comprehensive with other referenced boards, drawings and documents or might even be a 'napkin' sketch. It is usually, however, what underpins the production and scope of works required so adequate time and/or resources should be allocated to making this as accurate as possible. Depending on what the production is, often a rough cut or pre visualisation is created that takes into account all the previous input, this animated storyboard gives a great overall feel of pace, an understanding for everyone as to how the production is looking and shaping up, this may go through several revisions before all parties are settled to pass it on as a final design piece. If the production requires a film shoot, this is where all the filming organisation happens, from crewing up, sourcing your Director and/or DOP, location scouting and reccie.Set and Studio equipment, design, build and rigging requirements are established. These elements are then processed into the shoot schedule and combined with Cast/Talent, Location services and Logistics with scheduled presence and availability to procure an efficient shooting map of all resources required. The culmination of all preproduction work. Everything at this point has been approved or signed off as production ready and leads to a storyboard and/or animatic that is ready to guide full production. All supporting artwork is in place including rough cuts with audio cues/guides, any set/studio, character, product feature/design are in place. On occasion maquettes or models are made for reference and sometimes scanned. Sometimes sets and or environments are scanned as a 3D data set. All supporting visual reference/mood/style is also finalised for production use and guidance. With reference to the Final Design and supporting materials CGI 3D models that are required for production are created. Depending on production different methods and routes are deployed here so that although the created 3D elements meet Final Design criteria, they are also tuned for either ‘real-time’ use or ‘pre-rendered’ usage [sometimes both] Any of the elements that require ‘life’ or ‘motion’ are ‘rigged’ - this process allows, movement, motion and expression that can be controlled and orchestrated in animation. The layout of the production is prepared at this stage, this is where all elements of the production are placed in context, the big picture, the overall scope of production is aligned so any of the constituent parts in the production find their place and timing in the creative process, this also flags any cause and effect or consequences of animations projects that bridge all three of our production processes of animation, filming and real-time engine development. Our core process, where all previous preproduction material guides and directs how everything comes to life, in this iterative process we breathe motion, emotion and soul into any performance required. This process is a cyclic and could be in parallel with filming and/or real-time engine development. A staged process where roughs, wirelines and blocks are used to hone the performance and any interrelation before it’s passed on for final assembly, treatment and polish. Preproduction material and direction will have dictated any requirements for any application build, here any choice of game engine or application framework will come to life. The cyclic process of testing and integration both 3D CGI assets and filming are tuned to meet all design requirements and reliability of execution. Lights, camera, action - any filming is completed to schedule and layout with feedback loops provided if necessary to ensure integration with any CGI components and any ‘in engine’ requirements. Any chroma [green/blue screen] shoots required would be completed here along with any scene data capture for lighting. Environment scanning, capture, reference materials and texture data would also be collected. Performance/motion capture can also be acquired. For CGI elements that are used either solo in production, or in a game engine, or seamlessly integrated with film - all need to be textured and lit in a way that suits and follows artistic direction - this process is where a combination of textures and materials are created that are applied, wrapped or baked onto the 3D CGI models, the overall lighting and effects are also applied here to attain directed ambience and feel of any given scene or situation. Applications, CGI and Vfx elements combined with film that are being developed for production go through a continual testing process. This is to ensure that all elements and target platforms operate, perform and align correctly, this also enables us to share work in progress. Some deployments may have many different platforms and hardware configurations that require testing and proof of continuity creatively and operationally. Rendering is the process where all the frames of animation are processed, they are sent to a dedicated render farm that uses either CPUs and/or GPUs to effectively ‘colour in’ each frame. Different sequences of animation sometimes have several render process’s to go through - this creates multiple layers for the same sequence - In the final rendering the highest quality settings are used at the highest resolution target, these layers are then passed on to be used in in the final post-production compositing process. The closing stages. At this stage all the rendered files are now layered together and blended to form a coherent single layered sequence of images that represent the original drives of the storyboard and match the look and feel of the original visual development.Depending on the production different tools can be used to create various layered elements. Generally any filmed content arrives as rushes, these are edited to match the original animatics and storyboard direction, usually a director's cut is quickly assembled and maybe fed back to set or filming to ensure director's vision is on track, these edits and cuts that will contain 3d CGI and/of Vfx will also be pushed around the pipeline to be used as guides for making sure the final composition of effects with the filmed elements have full alignment continuity. During final compositing all creative layered components from upstream processes are carefully and meticulously put together to fulfill the original design and art direction. All 3D CGI animation, Vfx and film are combined to produce the final look and feel of the production, complete with all audio. Master builds are created for all platforms of release, the final formats are encoded, checked and tested on their relative deployment platforms ready for release. Once the platform conformity checks are approved the final production copies are released to their respective deployment platforms. et us help you tell your story - even if you just have the slightest idea of what or how you want to message your clients, or you would like to increase your reach and levels of engagment - contact us right now, with no obligation and discuss your ideas. f you want to see a quick overview of productions we have successfully produced then check out our show reels to see how we have empowered clients across a range of markets and disciplines. till not sure? have a question? No problem, either drop us a mail or give us a quick call, we would love to hear from you - and answer any of your questions about our services or ideas you may have.